Over the past seven years, I’ve competed in quite a few speech competitions. 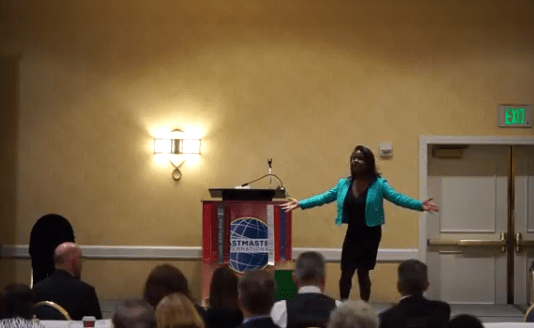 I’m still an active member of the Toastmasters International organization, and speech contests happen twice a year during the spring and fall. One of the proudest and happiest moments of my life was when I placed first, out of 8 contestants, in my Toastmasters district’s Humorous speech contest in the fall of 2014. No easy feat! The International speech contest is the major speech competition held every spring in Toastmasters clubs across the world. I also participated this year, and made it to the division level last month. While I did not win (I placed second), it was still an exhilarating experience! From the talented competitors to the speech topics to the energy everyone brought to the stage…every contest I’ve been in is always different from the one before. Recently, I was reflecting on what the best contest speakers have in common. There are certain qualities that these speakers share that make them stand out from the competition, from what I’ve observed through the years. These are qualities that will help you give a memorable performance, no matter the type of speech. 1. They take the audience on an emotional rollercoaster. The top competitors I’ve seen don’t let their audience members remain in an emotionally static state during their talk. They tell personal stories and give examples that make the audience feel high highs and low lows, like a rollercoaster. The audience member feels very happy one moment, then sad, then anxious in anticipation of what will happen next, and then finally sweet relief! You get the picture. I remember listening to a contest speech once that was sad and depressing the WHOLE time. I couldn’t wait for it to be over! Make sure your speeches have a dynamic element that ensures the audience feels a range of emotions, which helps you maintain their interest and attention. 2. They stay focused. The best speakers aren’t the ones who never make a mistake; they’re the ones who make a mistake and move past it. They don’t dwell on an error. Some might even acknowledge it by making a joke! During one competition I was in, a contestant had trouble remembering some of her points. After one particularly difficult moment recalling the material, instead of panicking – she paused and calmly referred to the notes she had brought with her to the stage. She looked at the audience and acknowledged she was having a few stumbles, but that she was “still going to get her message out.” I silently applauded her for that! Some people may have been too thrown off to continue, or been visibly shaken. She stayed focused on getting her main message across, and indeed did get through it. 3. They arrive before they arrive. The audience can feel your energy before you say your first word. When the contest chair announces a contestant’s name, and that contestant walks to the stage with an air of confidence and bounce in their step, I’m ALL ears for what they’re about to say. When the contestant has an excited energy about them, it makes ME feel excited to hear them. After the division contest was over that I just competed in, a woman from the audience came over to me. “I just want to tell you I enjoyed your speech. The way you walked to the stage – I was like ‘YES!’ I was ready to hear you!” Let your stage energy precede you. 4. They stay in the moment. Once these speakers get into their speeches, they stay there. Meaning, when they’re talking about something happy that happened, they exude that joy. When they mention a funny incident, you will see them have a big smile or maybe even grin. If they’re passionate about a point, you will hear that conviction in their voice and see it in their face. This is different from speakers who sound as if they are just speaking “from their heads.” In other words, they are so focused on getting their memorized words out perfectly that they forget to speak from the heart and be in the moment. Audiences can feel the difference, trust me! 5. They tell their own story. One last observation I’ll add is that the most memorable speakers talk about a topic that they care about. They’re not just speaking for the sake of speaking. They have a message that is near and dear to them, and that they feel compelled to share with others. It is about something they have personally experienced, not an entire speech about someone else’s experience. I’ve seen the latter in a competition, and there was a slight disconnect there for me. The speaker was not a part of the story in any way; I did not understand why or how this message affected them so much. It was similar to someone reading a book to me about what someone else went through. I highly encourage speakers to dig deep into their own life to hit a more personal home run with the audience. These are my top five observations about what helps a speaker shine on the stage, whether in a competition or another speaking opportunity. Let me know your thoughts on them, or what other quality stands out to you!